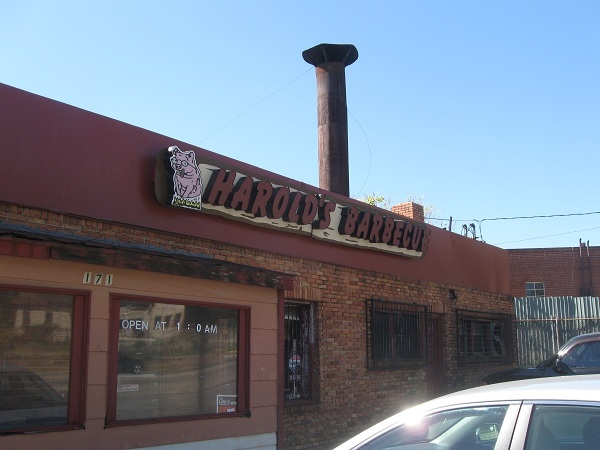 Harold’s Barbecue, Atlanta GA (CLOSED) – Marie, Let's Eat! There are so many barbecue restaurants in this state that I’ve never tried. Even the old ones, like Harold’s, which has been around since 1947, I’ve just never got around to before. Well, on Saturday, we had originally intended to take another short road trip, this time out to Augusta. Unfortunately, the bank balance is a little low, so we elected to save the gasoline and find a new meal intown instead. There are four restaurants in Atlanta that are reviewed on roadfood.com that we have not written up for our blog yet. A roll of the dice brought up Harold’s, so I rang my parents and asked if they’d like to join us. Harold’s is a simply perfect destination for a Saturday lunch. It’s very easy to find, just a quick little hop off the downtown connector at exit 244 and south less than a mile. It is in a pretty rough-looking neighborhood about a stone’s throw up the street from the federal pen. If you’ve never seen this gigantic building, you should, as it’s an architectural masterpiece. Unfortunately, Harold’s itself is in a pretty basic and deeply ugly building, and the bars around the windows and the air conditioning units don’t inspire great confidence in the local residents’ rap sheets. I apologize for repeating much of the online information about this restaurant, but some things are so blatant that I can’t avoid coming back to it. I’m very glad we finally stopped into this Atlanta institution. Despite the “keep driving, and fast” exterior, the inside is cozy and relaxing, and also quite chilly, since one of the air conditioners seemed to be working overtime. There’s a glorious smell of thick smoke throughout the building, and interior walls in the kitchen that are blackened from more than sixty years of smoking. It’s a building with a lot of history; we were taken care of by Harold and Hugh’s granddaughter, who’s been here for forty years herself. As for the food, the chopped pork is pretty good. It’s very soft and dry, almost incandescently white. Unfortunately, I didn’t like either of the sauces at all, and made the considerable mistake – the novice mistake – of just pouring the hot sauce all over my food before testing it. Theirs is a thick, red, tomato-and-pepper concoction that leaves a Tabasco-style aftertaste and overpowers the subtle, smoky taste of the soft pork. While I would certainly recommend Harold’s, I would caution anybody going to try a little on the side before indulging too much. The main dish is pretty good, but the sides are just outstanding. 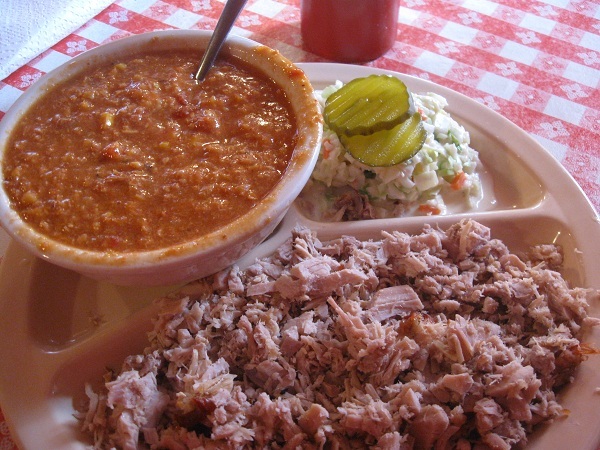 The Brunswick stew is probably the best anywhere near Atlanta. It’s really thick, with a very heavy corn flavor, and lots of tomatoes and stringy shreds of meat. The corn taste reminded me of the wonderful Zeb’s in Danielsville. The plates are served with a generous helping of cracklin’ cornbread. Crumble just a little of that into your stew and scoop it right back out, and that’s perfect. If I have had cracklin’ cornbread – named for the little pork cracklings that Food Network describes as “little pieces of pork fat, fatty meats, or ham skin which are left crisp and brown after the lard or fat has been rendered from them” – before, I don’t recall it. Honestly, there’s not a great deal of meat in the bread, but it’s so tasty that didn’t feel that I was missing anything. The slaw is also excellent; a perfect blend of mayo and vinegar that goes extremely well with the stew and pork. It’s simply a perfectly balanced meal, even if the sauce was disappointing. Harold’s attempted to expand just a little from this neighborhood, but unfortunately it didn’t last. There were two outposts south of the city, in Jonesboro and in McDonough, and a third up near us in Kennesaw, but apparently all three have closed. Only the original remains, which, honestly, is kind of the way it should be. Older joints with this much history, well, visitors should go to them for the experience almost as much as the food. With stew this good, I hope to be back for both before too long. Posted on October 18, 2010 July 29, 2017 by Grant G.Posted in atlanta, barbecue, georgia, goodbye, roadfoodTagged atlanta, barbecue, closed!, georgia, roadfood.com, southern belly. Pingback: Fox Brothers Bar-B-Q, Atlanta GA (take two) – Marie, Let's Eat! Pingback: Fox Brothers Bar-B-Q, Atlanta GA – Marie, Let's Eat!